Reflexite Hot Dots - 8 Count. You are buying one sheet of 8 dots - your choice of color. If you need to test a color or two, buy 8 ct sample sheets! It's the smallest quantity we sell and allows you to choose make your own sample pack to see what color works best for you. 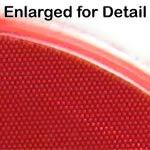 We also sell these dots in 16ct, 32ct, and 64ct sheets. Reflexite Hot Dots are brightly colored 1" vinyl super reflective stick-ons which can be used for marking, safety & decorative purposes. These Hi Viz dots are available in 11 colors that retro-reflect even when wet! Buy an individual sheet of 8 dots and see how they work before commiting to a larget quantity. These retro-reflective vinyl dots are made from tough, flexible, UV stabilized, weather resistant polymeric film with integrally bonded micro-prism elements. They are extremely durable and will withstand rugged outdoor and multi-purpose use. Ideal for color safety, coding purposes or to increase visibility in low light conditions, hot dots are extremely useful in many different scenarios. Put them on helmets, kids backpacks and school bags, workers safety belts, signs, or anywhere else where this added visibility is needed. These are ideal for marking paths to bring attention to potential hazardous areas, and so much more. Great for mail box and route ID. Use them to create lanes, aisles and escape routes. The list of uses goes on and on!